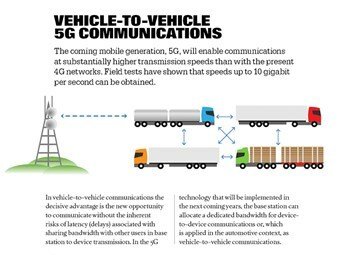 Scania looks towards 5G communications. Swedish truck manufacturer Scania has announced it is testing 5G components for transport communications with the help of Ericsson Research. The new mobile technology has been fitted at Scania’s R&D facility and will feature in a number of connected vehicle and autonomous driving tests. "The new test network with its 5G components allows for a high quality mobile network service, with low-latency and high bandwidth, where a lot of complex data can be transferred very quickly and very reliably – providing us with a ‘priority communications lane’ when it comes to projects such as autonomous driving and platooning," Scania’s project manager for city automation Anders Ställberg says. With 5G offering higher levels of support compared to 4G, the technology will be able to overcome crowding issues that currently hamper 4G as other users stream content or play online games that require high levels of bandwidth. Scania believes 5G could also work to facilitate vehicle-to-vehicle communication for important tasks that need fast responses such as braking or directional information. In platoons, these tasks are currently being carried out by Wi-Fi communications. An internet-connected vehicle using 5G would have a wider information reach than those using WLAN technology, as any vehicle in the world could know where it is, rather than those within a restricted distance. Scania says another value could be its ability to constantly update an internet-connected map as autonomous vehicles move through the world’s road networks. Ericsson Research 5G national research programme director Torbjörn Lundahl says it wants "to show other companies how 5G can enable and support the digital transformation of their industry. "We hope to gain valuable insights and innovations that will pave the way for further digitalisation, using 5G as an enabler. "The trials with Scania will help us to understand the requirements to ensure they are met by the 5G standard and products, and deepens our experience with the transportation sector which is a focus industry for Ericsson." The 5G tests will be restricted to Scania’s Södertälje testing facility.